Their bow shreds the digital waves like a knife. They will take no prisoners. It’s the thrill of the kill they seek and they will stop at nothing until the software is theirs. 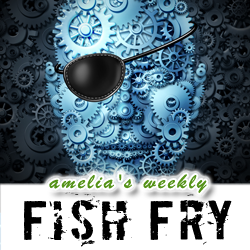 In this week’s Fish Fry, we are thwarting those dastardly cyber pirates with a mighty sword – a SmartFlow sword. Ted Miracco, CEO of SmartFlow Compliance Solutions, joins Fish Fry and we’re diving into the deep murky waters of cyber security in high tech. (I also ask him what’s it’s like to play football with Alec Baldwin!) Also this week, we check out a new retro DIY gaming system on Kickstarter called Tiny Arcade.